Working in the Searchroom at the Norfolk Record Office we regularly give advice to people researching their family history. A lot of the difficulties people come across are very similar, so we’ve put together our top ten tips which we hope will help people in their research. 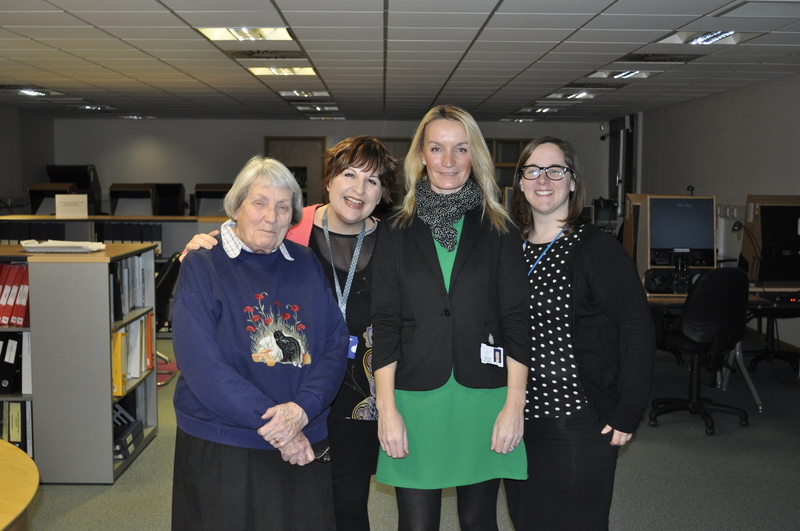 Some of the Searchroom Team with a regular researcher. When beginning your family research you should start with yourself, and work backwards. Confirm any family stories and details, don’t assume they’re correct. Always check any information you have against the original document. For example, when looking at transcripts check the original too. Gather as much information as you can before starting, like names, dates and places. Talk to family members who are still around! Keep everything written in one notebook rather than lots of individual sheets, so you don’t run the risk of losing important notes. Always write down the full reference of a document you’ve looked at, even if you didn’t find anything. That way in the future you’ll know that you’ve already checked that particular source. There is lots you can do online, but we are always happy to help and to give that extra bit of guidance and advice. Websites aren’t always accurate, so always verify things you find online with the original source. There is no better start than having a read through this Norfolk Record Office Information Leaflet. See you in the Searchroom! This entry was posted in Top Tips and tagged family history, Meet the Team, research, Top Tips. Bookmark the permalink.